An Australian National Consensus Position on Outcomes and Indicators for Diabetes Education identified knowledge and understanding as the outcomes most directly affected by diabetes education. A subsequent literature review failed to identify a validated, suitable questionnaire for measuring knowledge. Consequently, we aimed to develop a minimum diabetes knowledge questionnaire (DKQ) suitable for people with both type 1 and type 2 diabetes. Content validity was established through literature review, Delphi survey of 52 opinion leaders and a workshop of Australian Diabetes Educators (n ≥300). The resulting instrument was tested for internal consistency on 129 and for reliability on 57 people with type 1 and type 2 diabetes, respectively. The final questionnaire contains: 12 multiple choice questions common to type 1 and type 2 diabetes, e.g. normal blood glucose levels, complications, diet, exercise, selfmonitoring of blood glucose, annual check-ups, support services, and sick-days; two questions for people on oral medication/insulin only; and one question (sick-days) for people with type 1 diabetes only. For the first 12 questions, the internal consistency was good (Cronbach’s α=0.73); with the additional item for type 1 diabetes, the internal consistency was slightly better (α=0.79) as it was with the additional items for people on medication/insulin (α=0.76). No particular item seemed to adversely affect the overall consistency of the questionnaire. Comparing test-retest pilots, total scores showed good reliability with no evidence of change over time (t=1.73; df=56; p<0.85), and a correlation of 0.62. 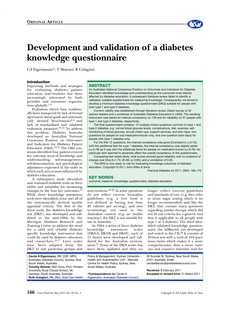 The DKQ is now ready to use for evaluating knowledge outcomes of diabetes education.